What are the definitions of mild and severe sunburns? What are their symptoms and signs? What home remedies get rid of mild to moderate sunburns fast? What about severe sunburns (pictures)? Sunburn is the result of too much exposure to the sun, or a sun-equivalent (such as a tanning bed or other UV source). 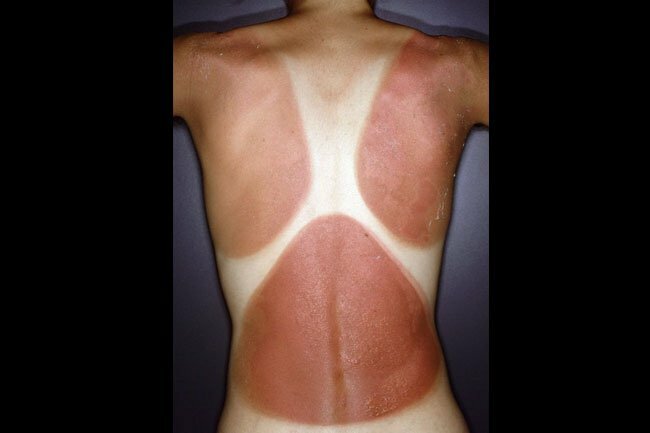 Sunburn is most common during the summer when the sun’s rays are the strongest. Mild sunburn symptoms include skin redness and pain. After about 4-7 days, skin peeling may occur. If you are sunburned, stay out of the run until the burn fades. Drink lots of water, sports drinks, or juice to stay hydrated, and keep your house cool using air conditioning or fans. Home remedies for sunburn include cool compresses and baths, some essential oils and herbs, certain foods or supplements, and over-the-counter (OTC) pain relievers. Place a cool compress on sunburned skin for immediate sunburn pain relief, for example, a compress containing Burow's solution (such as Domeboro Powder Packets -1 packet in 1 pint of water) to comfort and soothe sunburn. Take a cool shower or bath to cool your sunburned skin. Add one cup of apple cider vinegar to a bath to help balance the pH (acid or alkalinity) of sunburned skin, and promote healing. Soak in an oatmeal bath. This is especially helpful for itchy, sunburned skin. Add some lavender or chamomile essential oil to the bath to help relieve some of the stinging and pain. Add 2 cups of baking soda to the bath to help ease irritation and redness from sunburn. Avoid soap or perfumes in the bath water as these can be drying on already dry and sunburned skin. Essential oils such as lavender or Helichrysum can be applied in small amounts to the skin to soothe sunburn. Use lotions that contain aloe Vera to soothe and moisturize sunburnt skin. Some aloe products contain lidocaine, an anesthetic that can help relieve sunburn pain. Aloe Vera is also a good moisturizer for peeling skin. Apply freshly brewed tea after it has cooled to sunburned skin using a clean cloth. The tannic acid in black tea reportedly helps draw heat from sunburned skin, and aids in restoring the pH balance. Add mint to the tea for a more cooling effect. Apply teabags soaked in cold water to sunburned eyelids to soothe the burn and reduce inflammation. Witch hazel when applied to the skin can help reduce inflammation, and can help relieve sunburn. Apply petroleum jelly or Aquaphor ointment on sunburned lips to keep them moisturized. Once the initial sunburn has calmed down, coconut oil can be used as a skin moisturizer. Do not use coconut oil as sunscreen! Coconut oil does not provide any sun protection factor (SPF) or UV protection, so you are more likely to be sunburned if you use coconut oil in place of sunblock with SPF. Apply cool, not cold, milk with a clean cloth to your sunburned skin. The milk will create a protein film that helps ease sunburn discomfort. Vitamin E is an antioxidant, and can help decrease inflammation caused by sunburn. Use Vitamin E oil on the skin, or take a regular dose of the supplement. Vitamin E oil also can be rubbed onto peeling skin. Cucumbers have natural antioxidant and analgesic (pain relieving) properties. Chill cucumbers, then mash in a blender to create a paste, and apply to affected sunburned areas including the face. Cucumber also can be soothing for peeling skin following a sunburn. Boil and mash peeled potatoes, let cool, and apply as a dressing to sunburned areas. It is believed the starch in the potatoes helps draw out heat, which may reduce pain and speed healing. Cornstarch also can be mixed with water to form a paste that can be applied to skin to help soothe the sunburn. Take OTC pain relievers like nonsteroidal anti-inflammatory drugs (NSAIDs) such as ibuprofen (Advil, Motrin) or naproxen (Aleve) to help relieve sunburn pain and inflammation. Topical over-the-counter (OTC) 1% hydrocortisone cream may help relieve sunburn symptoms such as pain, itch, and swelling. If your skin is peeling following a bad sunburn, avoid picking at it or peeling it further. If you have blisters, this is a sign of a severe sunburn. It is best to cover them to prevent tearing and leave them alone until they heal. The best remedy against sunburn is prevention. Always use sunscreen with SPF 30 or higher, wear protective clothing and sunglasses, and avoid direct sun exposure. Hydrate, drink a lot of water, juice, or sports drinks. Your skin is dry and dehydrated. Replacing lost body fluids will help your skin heal from sunburn more quickly. If you feel hot from your sunburn, keep your house cool. Turn down the A/C and use fans to help blow cool air over the skin. Go inside or in the shade, and stay out of the sun until your sunburn fades. Exposure to more sunlight will only make things worse. Victoria State Government. "Sunburn." Updated April 2016.